When SAAC was started in 1976, nobody gave much thought to a registry. The cars weren’t that old and, as used muscle cars, their depreciation slide was beginning to end. Their values were beginning to rise in direct proportion to the interest and enthusiasm for them. Cobras and Shelbys were fairly rare in those days and, if you owned one, it wasn’t often that you saw more than two or three others at any one time. SAAC served as a catalyst to bring owners together and they began examining each others’ vehicles closely. They saw production inconsistencies between cars built in the same model year. A few enthusiasts had been informally collecting information like this, beginning with the cars’ serial numbers. 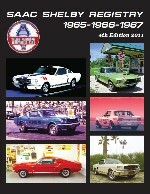 Each is over 1,200 pages and they are all presently available from SAAC. Registrars are happy to answer specific questions about individual cars. Every Cobra and Shelby has a unique serial number which was used to account for the car during its production, sale and shipping. That number was also used for registration purposes. These numbers, although different for each year, are all unique and sequential, beginning with 001 and ending with the last car produced. SAAC has factory production records which list each car, so today there is no question as to how many cars were built. If a Registrar is given a car’s serial number, he is able to track the car from the original dealer through the last owner that has been reported to them. Not all cars have turned up so Registrars are continually updating their ownership records whenever they receive new information. The latest particulars become part of the car’s individual history. Cobras and Shelbys change hands much more frequently today than they ever have and with increasing values, potential owners naturally seek assurances that a car is “real” before purchasing it. SAAC’s Registrars can usually provide this but it is not always the case. There have been occurrences of complete cars being recreated using serial numbers of wrecked or “owner unknown” cars. Interest in restoring these cars has resulted in virtually every unique part being reproduced. Sooner or later the truth about a counterfeit car becomes evident, but not always before a naive buyer overcome by enthusiasm becomes a fake car’s new owner. There can only be one car for each serial number and where there are more than one car, lawsuits usually arise. They are expensive to litigate and in the end a judge will ascertain which party has the “right” to a particular serial number. The loser could watch tens of thousands of dollars evaporate. 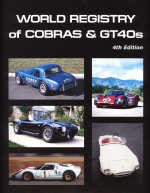 If you are in the market to buy a Cobra or a Shelby, we suggest arming yourself with a copy of the registry to learn about these cars. Once you’re ready to make a purchase, you should contact the Registrar to see if he has updated information beyond what is in the registry. If you wanted to buy a five carat diamond you would go to a reputable jeweler; you wouldn’t buy it from a fast-talking stranger at a flea market. SAAC’s Registrars are knowledgeable, long-time enthusiasts and owners, but they are also volunteers. They are not 911 operators on call twenty-four hours a day. If you email one of them while you are sitting at an auction with the car about to go across the block, you shouldn’t expect to receive an immediate response. Their interactions with these cars, owners and enthusiasts interested in them is their hobby — not their career. They usually respond to requests for information in the order they are received. We don’t want to give you the idea that buying a Cobra or a Shelby is like walking blindfolded through a minefield. For every 250 Cobras and Shelbys that change hands, maybe one has a questionable history, so the odds of going it alone are on your side. But if you are the one who gets stuck with the fake, the odds don’t matter. The point is, why go it alone? Why not rely on the experts BEFORE you spend north of $100K on a car? We don’t have an answer for that. Like we say, buy in haste, repent in leisure. The registry is currently available in three separate hardcover books. We are often asked if the information contained in them is available online. The short answer is "No." The reason for that is that the registry is an unimpeachable source of specific information on these cars. If we were to incorporate everything into an electronic data base and make it available, there is no way we could guarantee that information in it would not be changed. With computer hackers able to steal identities and break into government files, how could we possibly guarantee that information being passed around on the Internet, based on what was included in an online SAAC registry, was accurate? We couldn't. And that would render the registry worthless as a reference source. We didn't put years and years of work into publishing these books only to see them modified by unscrupulous scam artists intent on changing history in order to make certain cars more valuable. Our advice: Get used to hefting thousand plus-page, eight pound books. Unimpeachable sources.